Have you been avoiding the legal parts of your business? If there's one thing that makes most business owners want to run under the covers and hide, it's getting legally protected. Even some of the most successful coaches, entrepreneurs, and business owners have no idea where to start and wonder if they're doing everything legally right. And let's face it, law doesn't seem to jive with the soulful, loving work that you're putting out into the world. It can feel confusing, intimidating and overwhelming. Law just hasn't seemed to feel easy for heart-centered business owners. Until now. This groundbreaking book doesn't just offer accessible and easy-to-implement legal steps. It translates legalese into legal ease so that today's movers and shakers can stop worrying about lawsuits and get back to changing the world. Equipped with her refreshingly bubbly personality and her past experience in a large corporate law firm, this book guides you through 7 key legal steps and soul-centered principles, each aligned with one of the chakras and a different stage of business growth. You come out the other side with 7 key legal steps to protect yourself and the unshakable knowing that all aspects of business - even the legal side - can be full of ease, support, and love. "Exactly what you need to feel legally secure and high vibe in business." "Lisa's a whip-smart lawyer, intuitive coach, and earth angel all rolled into one." "Easy Legal Steps is the game-changer heart-centered business owners have been waiting for." "Easy Legal Steps is a gift to the world of entrepreneurs! Beautifully blending the law with the heart, Lisa Fraley's loving legal wisdom leaves us empowered to put the boundaries in place that hold our sacred work so we can soar abundantly with peace of mind." "Lisa is my go-to legal guide and her book provides a refreshing perspective that takes the fear out of protecting my sacred work in the world. Her words are empowering and life-giving and I am making this book a recommended read for each and every one of my clients. Thank you, Lisa, for having the courage to share your brilliance in this beautiful way and, in doing so, giving me wings to do the same!" This book was okay. Honestly most of it is not about law or protecting your business. The bulk is about shrakas and personal growth which is not at all what I was looking for. I think Fraley forgot her audience is looking for legal advice and education not psychological information about the Ego or personal mantras. Many of the chapters seem repetitive and several pages are lists of how you as the client may be feeling about a particular scenario. She mentions her "cheerleader personality" and blonde hair multiple times which doesn't make me identify more with her (I believe that was her intention), instead it makes me question her ability to advise me as a trustworthy source of information. Obviously cheerleaders and blondes have a national stereotype as being dumb which threatens her credibility in the eyes of the reader. I know Fraley does not fit this stereotype but I say this as constructive criticism and encourage her to use different descriptions of herself and only mention them once. Overall, huge sections of this book could be taken out. The reason I keep two stars on this review is because the small segments of actual legal advice and information are GOLD. I would rate this five stars if I could just consolidate the book into purely legal information. However, since the bulk of the information was not legal information (but psychological and spiritual related) I felt like I wasted my time. I would not recommend this book but I would recommend the DIY resources listed on her website. 5.0 out of 5 starsHow Getting Legally Covered Becomes An Act of Soulful Empowerment! Lisa Fraley does an incredible job of making getting legally covered not only clear and accessible, but actually fun and empowering. 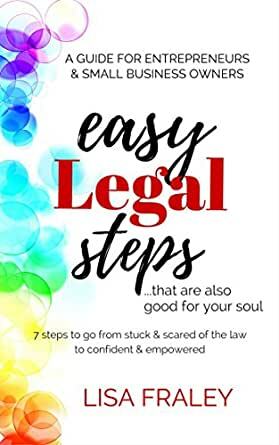 Easy Legal Steps breaks it down and makes it easy to recognize not only the "shoulds" of legal coverage, but the openings that happen for us emotionally and spiritually when we know that we are able to conduct our heart's true work on a firm foundation of solid protections. I've never come across any lawyer who brings such heart, soul and solid guidance to her work. Thank you, Lisa Fraley! Loved it! Every entrepreneur needs to read this book. Lisa Fraley took away all of the fear (and I had a lot!) that I had about the multiple legal steps involved in owning my own business. She breaks each step down into simple, understandable and relatable nuggets. Most importantly, the book made me realize just how important having my legal processes in place is for the success of my business. I would have never thought that the two would be related, but now knowing the correlation has made me prioritize my legal needs in a much more pressing manner. I am so thankful to finally hear a lawyer explain what I need for my business and why I need it in a voice I can understand and relate to. If you own your own business, do yourself a favor and buy this book today! In her book, "Easy Legal Steps...That Are Also Good For Your Soul", Lisa Fraley merges the seemingly opposing worlds of "left brain" legal with "right brain" heart. Lisa calls this "Legal Love™." Each chapter offers advice on the necessary legal steps for aspiring & established entrepreneurs, as well as a fresh perspective how these concepts can enrich our lives. Her unique personal stories found in the book illustrate how she dealt with her own fears and vulnerabilities. These personal tidbits help make the "legal speak" relatable and down-to-Earth. Ultimately, Lisa's book is about helping you build your courage. This book provides valuable tools for your growth as a business owner and a person. And fortunately for you, these tools are infused with "Legal Love™"! Best of luck on your entrepreneurial path!